The shadows make the image here. Then this is a composition only apparently “normal”. There is a lot of elements to see in this image. Many “micro compositions” enclosed in frames. Great work. Interesting shadows and lights image. All the scene in is resolved in the central part of the frame. The Hitchcockian figure is the gem of the shot. Creating interesting street photographs at events? For sure. Great character in the foreground and perfect the female figure behind him. Marcelo Caballero has presented many images and a lot of them deserved the gallery. At the end I have chosen this to to highlight how important is the setting and the choice of the right place in Street Photography. I love this image for the women in sequence: there is dynamism. 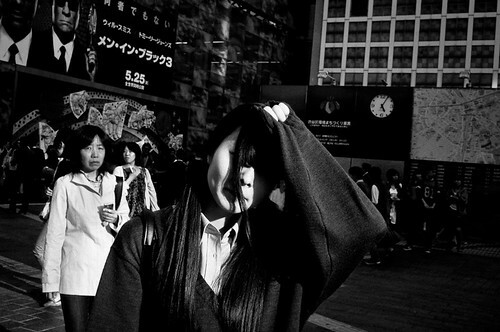 The woman in the foreground reminds me the work of one of my favourite masters: Daido Moriyama. Another shadows and lights. The picture has made by the seated man. The light works for him. Benedicte proposed three images really interesting. To the end this is my choice because the posture of the woman is really interesting. Closed door, closed woman. Juxtaposition works. I’ve seen a lot of images like this, but they’re not like this. The composition here is perfect, also the dynamism. Good. I love the street photography taken at the beach. I love this image for the hirony, but also for the composition. A lot of envinronment on this one. I love this image. 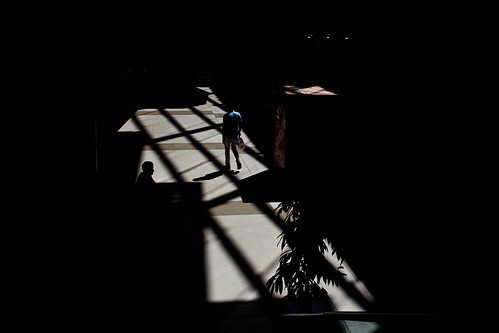 Street Photography sometimes is a snapshot with a stunning moment. I believe in this. For me great image. i’m so glad that my image chosen for here. thank you! And I am happy to see you here. Congratulations! Is an honor to see in this remarkable blog a picture of me selected. Congratulations to other selected photographers, and thank you very much, Alex! My honour hosting you and your photographs. Committed to provide visibility to the talented photographers. Thank you Alex… Again! I’m glad you like my work, really. Great selection by the way ! Thanks to you Baptiste, and congratulations! Honored to be part of the selection, Alex. Thank you. Happy to see you here, Arthur.